Another moment was priceless, as while back I showed Jacky Ickx in 2004 at Goodwood Festival of Speed in England... a photograph of his ultra rare one year Bell Double Eye Port Helmet that we had and that Jacky used in racing being sponsored by Martini and helmet with the traditional Jacky Ickx dark teal blue with white outline and we have stayed in touch with Jacky since that time. I had sent him a gold Tazio Nuvolari Turtle that I made and designed and sent it to him in Belgium about 3 years ago and never heard back from Jacky... he was at the Chopard Porsche Race Car Exhibition often for autograph signing sessions and we met with Jacky and he apologized for not writing back to me about receiving the gold Nuvolari Turtle, but said that the gold Tazio Nuvolari Turtle Amulet I made travels with him wherever he goes and brings him luck, as a Talisman. We took the Bell "Martini- Ickx Helmet" with us to Rennsport VI hoping to catch up with Jacky Ickx at the Porsche Event. It was so fortuitous that the incredibly rare Porsche race car- the Martini Porsche Jacky Ickx raced using the rare Bell helmet we have, was showcased at the center of the Chopard Porsche display... so it was a incredible reunion of Jacky Ickx and his Martini Bell Double Eye Port helmet and with the Martini Porsche Race Car. I asked if the centerpiece in the middle of the rare Bell Helmet affected his racing and Jacky said that within a few minutes, could not even tell it was there... a priceless moment at Rennsport VI indeed. 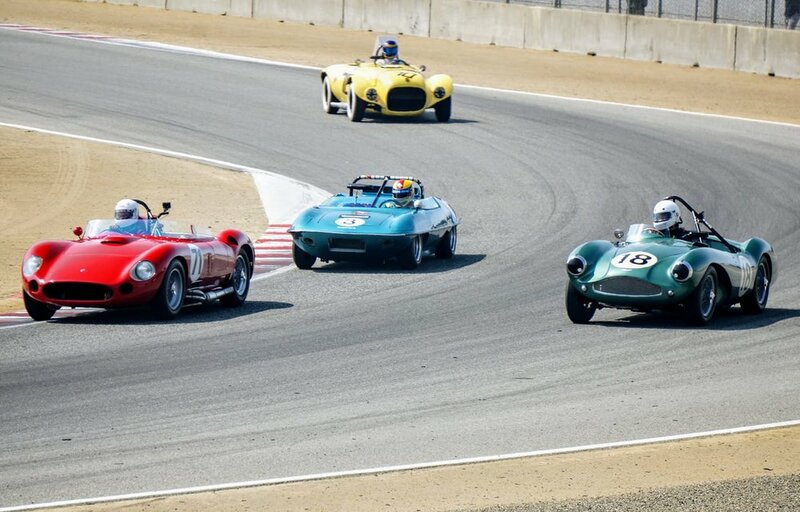 The 1958 Kilpatrick Speedster had engine failures and we were not able to race in the last race of the weekend but we did have the honor once again to try to “re-trace” the General James Kilpatrick “racing lines” at Laguna Seca Raceway, as it was the “home track” for the General. The theme for the 2018 Monterey Reunion Races at Laguna Seca Raceway was brilliant with the showcasing of the Nissan racing legacy. With the theme, there was the bringing of so many of the most significant Nissan and Datsun racing cars from other states and abroad. It made us all proud that legendary Pete Brock and John Morton were the stars for the entire weekend as they together established memorable racing history with their achievements. Nissan was in full force exhibiting their latest Prototype vehicles as well as their historic and iconic racing cars from their Museum in Japan. There were many of the original BRE and John Morton raced cars on display. The racing was spectacular again as the grids are carefully selected. 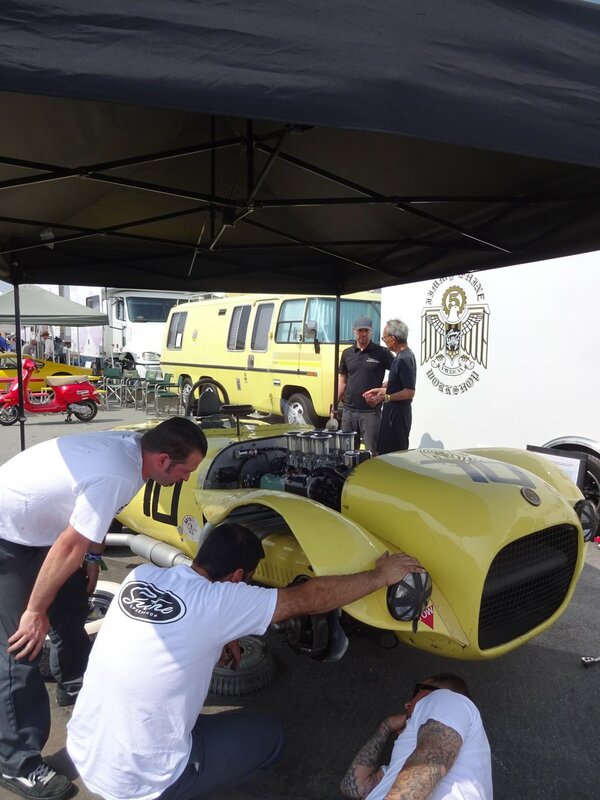 With the legendary Jimmy Shine Shop and crew preparing our Old Yeller II and Shelby Cobra CSX 2203, at the 2018 Monterey Reunion Races, we had so many new and complex problems with both cars to solve for the crew consisting of Jimmy Shine, Branden and Poli.’ It was the drama of non- stop work on the cars by the crew each day at Laguna Seca at Monterey. Rare problems occurred with the Shelby Cobra as in Pre Grid the two top plug wires were burnt… and the mounting bracket for the starter broke not allowing the Cobra to start. The Cobra finally broke completely on the track on the “Pace Lap” in the final Rolex Race, as the transmission was locked out and could not put into any gear! The Old Yeller II exhibited a major hard pull at the left front upon braking and did not get many laps in Practice and “Qualifying” sessions. The left front Buick brake drum was “out of round” and both drums were taken to a machine shop in Monterey to be “turned,” The problem came back again and one session the Coil Wire became detached and stopped running while on the track… and a rare incident to happen. We barely made it to the Pre Grid in time with the Old Yeller II for the final Rolex Race for 3A Race Group for Old Yeller II and we had to lay back at the back of the race grid of cars to test on the track if brakes would not grab and jerk hard to front left. The final move by the great crew to swap the rear drums to the front worked well enough with a “bias” adjustment. We still had slight pull to left, but it was manageable during the race and still not at 100% braking efficiency...we raced with a determined goal to finish the race for the hard working crew. With the “wounded” Old Yeller II Buick Special we somehow placed 14th in the race. We faced an incredible challenge this year, as Goodwood was confirming with us if we were bringing our 1959 Old Yeller II Buick Special to the July 2018 Festival of Speed. We did not receive our hard copy invitation, as we had changed an address. Our Old Yeller II had to still have our new John Beck Buick 401 Nailhead engine installed and we barely made it to the event and without any testing. The Jimmy Shine Shop was scrambling prepping the OY II for shipping and the short time left made the Air Cargo the only option to get the OY II to U.K. 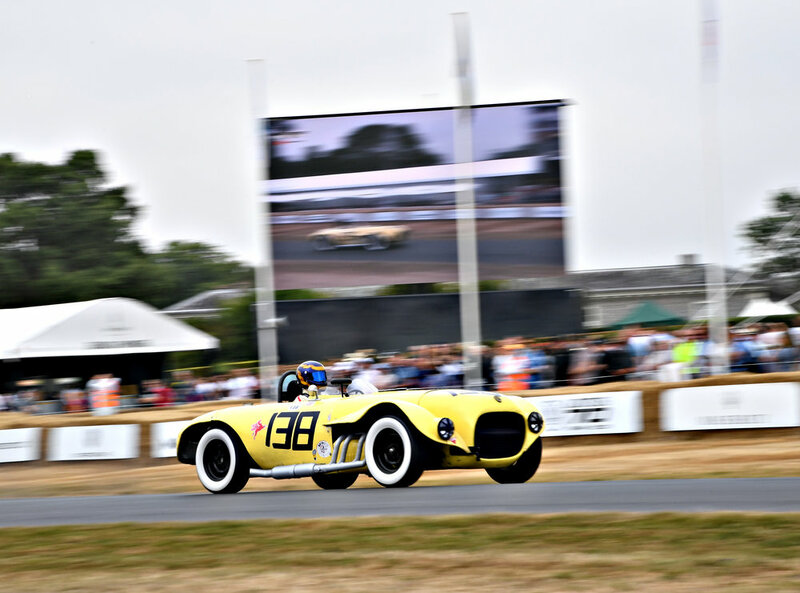 The invitation to the Goodwood events is considered one of the most coveted invitations for race-car owners and drivers, as we always respect that. We arrived on a Tuesday into Emsworth, which is a village near the Goodwood Festival of Speed event. Thursday was the “Load In” day at Goodwood and the event is a sold out “Hill Climb” race with over 170,000 tickets sold. Our first invitation to the Goodwood Festival of Speed was in the year 2000 at which time Lord March (now titled Duke of Richmond and Gordon) invited our Old Yeller II Buick Special and paid for air cargo, Business Class tickets, and elegant Mill Stream Hotel… and placed us in the paddock next to Dan Gurney and his legendary Eagle F1 race car and next to us on the other side to Phil Hill in the Scarab. This year our Paddock was very close to the giant parking area and just adjacent to the huge special parking for all of the “Super Cars” including Ferrari, Lamborghini, McLaren, Porsche, Maserati, Jaguar, and special builds so it was a sight to see. We shared Paddock space with a rare Cheetah #001 with a Prototype aluminum body and potent Chevy engine. Along the Paddock line was Nick Mason’s Ferarri GTO, which may be the most valued automobile on the planet, the Jim Hall Chaparral, Shelby Daytona Coupe, and the very rare race Alfas nearby. The Goodwood Festival of Speed has grown immensely to include the “newest of new” with all of the automobile marques launching their best new models for the year with the venue titled- “First Glance.” There were sightings of a few F1 stars like Bottas and other international racing legends. We are always proud to see our legendary Richard Petty and Johnny Rutherford. We met with Rod Millen again, as he is always a solid contender in the Final “Shoot Out” in his legendary Toyota Pikes Peak Hillclimb car… we raced our Old Yeller II in 2017 at the Rod Millen- New Zealand “Leadfoot Festival,” The Festival of Speed is like having so many great museums come to Goodwood, as all of the major brands bring their “Crown Jewels” from their collections related to racing. The drivers and owners were given beautiful metal medallions on a ribbon from Martini Racing for entry into the Martini Racing Drivers Club, which provided breakfast, lunch, and afternoon tea. The spectacular “Red Arrows” jets presented a brilliant air show as the “Drifters” wowed the huge crowds. The Duke of Richmond and Gordon presents a “Grand Ball” Black Tie event and this year the crowd was huge due to the major sponsors and automobile companies Internationally. The Honda Company sent over from Japan with a big team of engineers bringing the rare Honda F1 John Surtees race car along with rare motorcycles. All of the loyal Festival of Speed fans could not complain, as there was endless venues within the venue including an adjacent Rally Circuit for Rally fans. 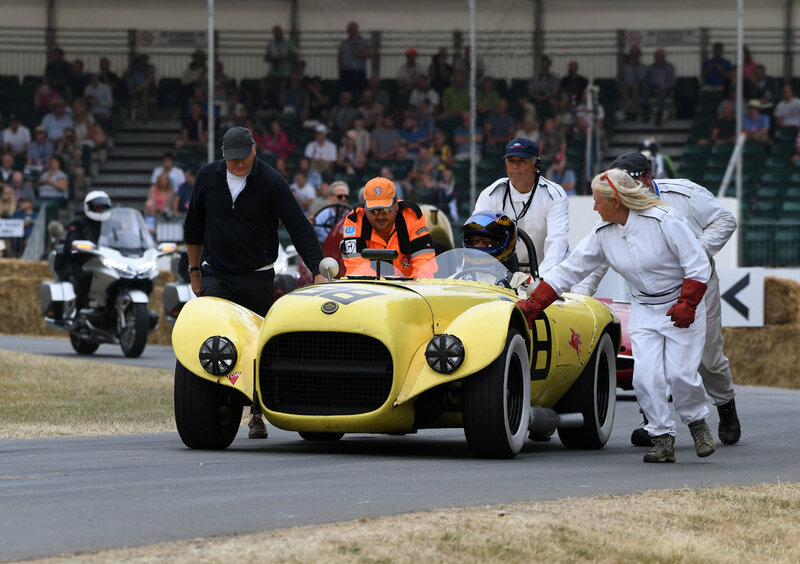 The Old Yeller II Buick Special was invited to the 2018 Rolex Australia F1 Grand Prix Historic event in Albert Park, Melbourne, Australia. The 1959 Buick 401 Nailhead motor had imploded during the Practice Day at Phillip Island Classic Festival of Motorsports and huge efforts were made to build out a stock Buick Nailhead motor for the Old Yeller II from a Buick motor for $1100 that was found locally. The Buick 401 Nailhead finally head together for the Australia F1 Grand Prix event. The Old Yeller II had been invited in the past Australia F1 GP events, which was a spirited Historic Exhibition Race, but now the format had been changed to a Parade Lap of 50 Special Invite Race Cars. The Parade Lap was on the Official F1 race circuit in Albert Park and a few hours before the Official F1 race. It was so tight in scheduling at the Port in Melbourne, as the Old Yeller II finally was released from Custom on Wednesday and Practice Testing at Phillip Island was on Thursday. We were moving well with the Old Yeller II in Testing Day and on the 4th lap the “Big Bang” moment took place while heading for turn 8. There was a thud and lost power with smoke so pulled off on the grassy area with a trail of hot oil following. The Old Yeller II had to be left along the roadway in the pits as was still dripping oil. The Buick 401 Nailhead Race motor imploded with a “Snap Crackle Pop” that resulted in breaking the camshaft, breaking a rod, hole in the oil pan, and tearing apart in the internal castings with pieces everywhere. Mark Johnson has a race shop and he was determined to try to get us back on the track. He posted everywhere that a race car needed a Buick Nailhead motor immediately and received leads as one motor was two hours away. The $1100 USA stock passenger 401 Nailhead Motor was picked up two hours away and brought to the track by 10:00 AM on Friday. The old motor was caked with an inch of oil and sludge that had to be scraped off. From that moment on was an epic non stop day and night effort by the crew. The galleys were clogged and the entire cleanup process was monumental. The broken motor was removed and all of the good “bits” were removed from the race motor to be put on the stock Buick motor. The old motor had to be cleaned and prepared and the newly repaired oil pan was cleaned of metal pieces. Damien and “Eggs” jumped on the project and never complained once about the difficult work and the motor that must have been stored for over 25 years. They worked non stop way and almost did an “all nighter,” as there was so much work prepping the old new motor. The Announcer came to ask what time we were going to start the old new motor for the OY II… and we had planned to fire up the motor at 9:00 AM Saturday, as that was the time the race motors were allowed to fire up. The Announcer made the announcement that we were going to start the new old motor and so many fans kept stopping by our pit garage to see if we would be able to race the OY II. We missed the Qualifying on Friday morning and the first race Friday afternoon, but officials said that we could race regardless by starting in the rear of the racing grid. 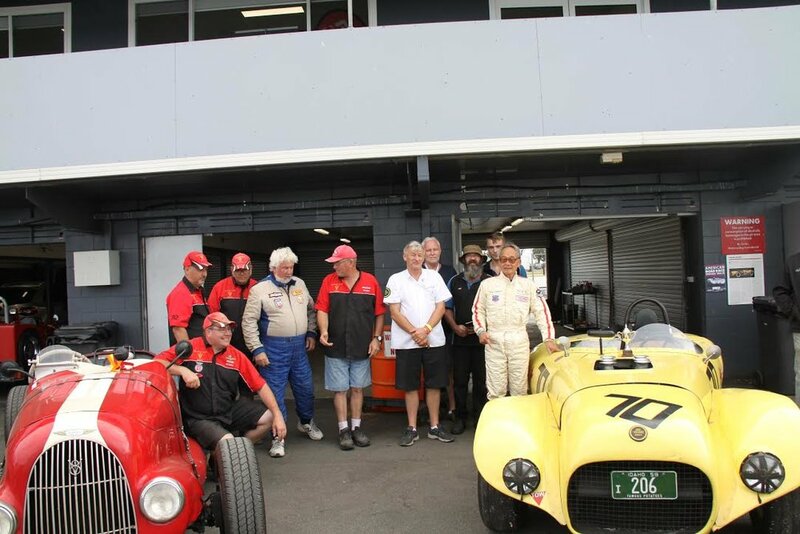 With Eggs, Damien, along with John Chalmers and Paul Hunter (nephew of Bruce McLaren) flew over from New Zealand to help crew for us… gave Mark Johnson some much needed mechanic support as a ton of detail work had to be completed. The pistons in the old motor were moving and everyone was breathing better. Everyone was doing the garage “Code Blue” to revive the old motor and we were able to enter the Saturday Morning race. We toured the track and got into grid position in our slot at the end of the pack of cars, but the temperature gauge was pegged at supper hot and started to lose power… with the Red Lights going off which started the race, we lost more power as we then pulled off the track to the right. The Race Motor head was cracked and water everywhere, which cracked a plug and water surging out the side. The guys were so incredible as they jumped on changing the topside and cleaning up old heads from the donor motor with the “mix and match” program. All day and “all- nighter” scrambling with such tenacity and constant saying, “we will get you out there,” Constantly the crew were faced with making makeshift modifications such as bearing and bushings that did not fit. Then there was the most humbling and respectful offers from two Racing Specials drivers coming over and saying…”You have to get out there and take my car for Sunday Races… and Ray Sprague going to the Officials at the Control Tower to have an official “Driver Change” for me to race his 1932 Ford High Boy Racing Special for the two Sunday Races. Our team went to the Morning Briefing for the Victorian Flaggers Meeting at 7:30 AM to present the 9 gifts from USA along with 3 trophies that had a flagger at the top… and engraved, “In Appreciation, Angel Under Our Wings” I was asked by the Chaplin of the event to present my “Tribute to a Fallen Marshal,” which was first written for a Marshal- Andy Carpenter, that was tragically killed at the Finish Line at the Goodwood Festival of Speed. It appeared we could make it into the Sunday Morning races and completed finishing the motor minutes before final call up in the assembly area… and in the assembly area I glanced over and saw three children that hat been hanging out in our garage as they came to the fencing to wave me and the Old Yeller II good luck. We proceeded around the track and noticed big smoke coming off the right side and knew we would be flagged in so had to take the short cut again as the valve cover gasket failed and oil was squirting on to the hot headers causing the giant smoke trail. The gremlins were hard to escape from and the guys again jumped on the motor to stop the new water leak squirting and the new oil leak. We barely finished the motor and went out to do the last race of the day for our race group. We were again placed behind all of the 40 race-cars and went on the Red Light Start as we passed some cars quickly, but felt the motor going was off power. We passed more cars and felt the significant loss of power and by the time of reaching the front straight, the power went away big time and passing the start finish we pulled off to the left of the track and the day was done in more ways than one. We were towed in for the 4th time in the 4 attempts to stay on the track. The gremlin was electrical as the battery was charged overnight, but the generator was not working effectively and lost power dramatically. The incredible element was that the Old Yeller II was so predictable and with smooth drifting in the exits of turns which has been a long time coming. Not once was there any anger or frustration for the endless string of different breakdowns, as “Eggs,” Damien, Mark, John, and Paul kept us afloat with their non-stop tenacity and hard work almost around the clock with grease filled hands and bruised knuckles… and we were all so uplifted by the non-stop parade of visits from the great Australian fans checking in time after time to see if we would make the race. It was truely an epic weekend of great memories and watching first hand, the quest and passion for mechanical excellence by the focused and dedicated crew over the entire weekend. Don’t miss a wonderful eulogy for racer and World Champion Phil Hill that Ernie wrote and reads during our talk. The Chateau Impney Hill Climb is the 3rd year for the iconic Hill Climb as the event was held many years ago and it has been resurected once again to become one of the prestigious Motorsports event in England. The backdrop is an accurate and historic French Chateau and the Hill Climb course is staged in front of the elegant Chateau. The Hill Climb is challenging with tight turns and elevation changes. 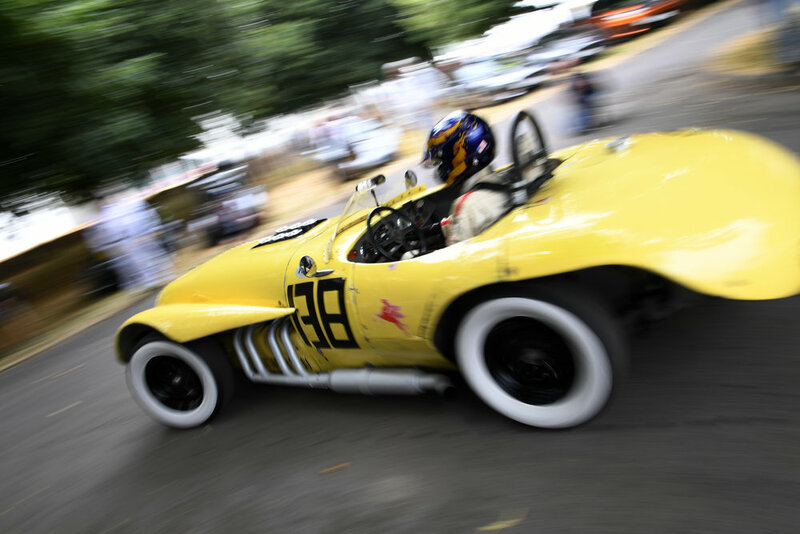 The incredible event which is a hill climb at the Chateau Impney attracts the best of “Historic Hill Climb Race Cars” as well as some more modern race cars. The invitation to particpate is a coveted invitation and last year we raced the Old Yeller II and the 1964 Shelby Cobra. The 58’ Kilpatrick Porsche was well prepped and it is not really a hill climb type race car, as the 1st and 2nd gears are very tall making it hard to get off the line at the start, but a great car to negotiate the sharp turns with good rises on the course. The motor would bog down at the slow turns and improved with the running of the motor longer prior to the start. The last run the motor really pulled strong and we got out lines better than ever and clipping along faster than all of the runs up the hill’... and over cooked the last left hander just before the final “weaving” section... locked up brakes and stalled sadly but going for it ... finally re-started and that was the disjointed run. The invite list was the most incredible collection of some of the rarest of cars including a gagle of ERAs and 250 Maseratis as well as McLaren Can Am car and Chapparals... and many of the historic small home built Hill Climber cars that could flash up the hill with speed in front of the Chateau. The Kilpatrick Speedster was an attraction as most said it was the first racing Porsche Speedster that they have seen as the majority of the Porsche Speedsters were destined for the USA market and especially to the West Coast area. Racing at the Silverstone Classic is on the “Bucket List” for so many and racers will never be disappointed if the opportunity arises, as the quality of the “stonking” grids of race cars invited is like a ‘dream team’ list. The weather brought intermittent rain at times, but most drivers had a dry track to qualify and race on. Silverstone Circuit was a massive former WW II RAF Bomber Station Airport and it was in 1948 that the first official race was held by the Royal Automobile Club on the airport tarmac. The very complex 3.66 miles long circuit with its 18 turns has also two very long straights, which is overwhelming learning curve for a ‘first timer’ driver and Silverstone recently held the F1 British Grand Prix. Silverstone being a very flat race track, it is impossible to see ahead around an upcoming apex of a turn and the fast turns very abruptly arises in view. It is like the mythical mermaid beckoning you in at the corners enticing you to go deeper and deeper into the turns than is wise or pragmatic, which can lead to an off track excursion in a blink of the eye. The staging of the 22 races of some of the most iconic race cars was an impressive feat. This year there were over 100,000 race fans or “punters,” as they say, attending on Sunday alone during the huge 3 day event and there were 120 Car Clubs with vast and ample areas for the clubs to share their cars and displays... even the Gaz 21 Club from Russia was participating this year. The distinctly different scenes at Silverstone to see was seeing the many highly elevated F1 fan viewing stands, huge County Fair size concessions/vendor areas, and big amusement sections for fans along with the providing Concerts in the evenings. This event is considered the largest Historic Racing event globally and the entrants are treated to racing on the British GP F1 circuit with expansive run-offs and very high speed corners. The monumental task was the Tech Inspection of the over 1,000 race cars and Tech scruitineers were scrambling in the older National Paddock and also in the International Paddock. What sets this Historic race aside from other events was the unmatchable blistering speeds and the majority of the cars in full 4 wheel drifts with corrections at the high speed turns and “kinks.” Traveling in the U.K. one hears “Mind the Gap” often, but mind you there is not much of a gap with the very ‘close quarters’ during the very competitive racing with crunched fenders from time to time. 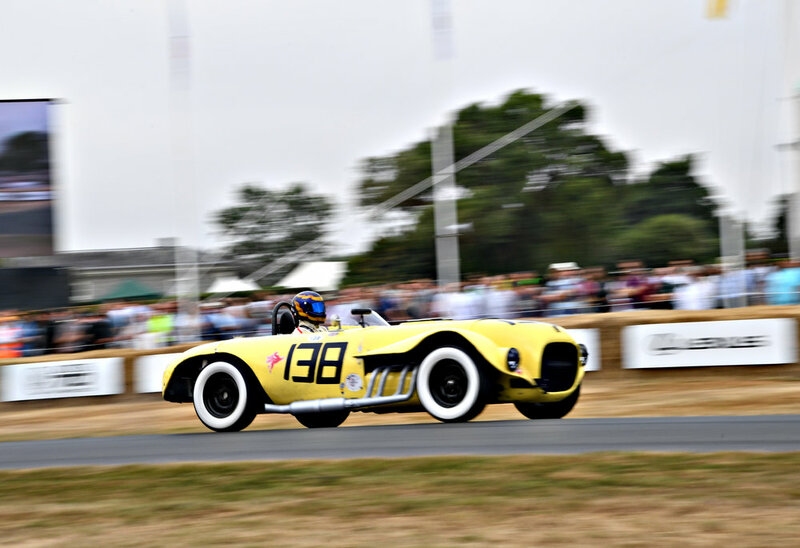 We raced the 1959 Old Yeller II Buick Special on Saturday in the competititive Stirling Moss Trophy Race for ‘Pre 61’ Sports Cars which in the 49 race cars included13 mighty Listers, 10 Lotus, 5 Lolas and 2 “D” Jaguars. We raced the 1958 Kilpatrick Speedster Sunday in the Royal Automobile Club Tourist Trophy for Historic Cars- ‘Pre 63’ GT Race with a grid of 53 race cars including 5 Aston Martin DB 4s, 6 E Type Jaguars, a Cobra, and a Ferrari 250 GT. Our races were 50 minutes long and a two driver race option. The 50 minute race with fast long straights was a test for the Old Yeller II drum brakes even with new Porterfield linings as the brake fluid cooked and little in brakes at the end of the race. We had to be alert to watch for the Pit Board sign to come in for the driver change, as the lap is 3.66 miles around. 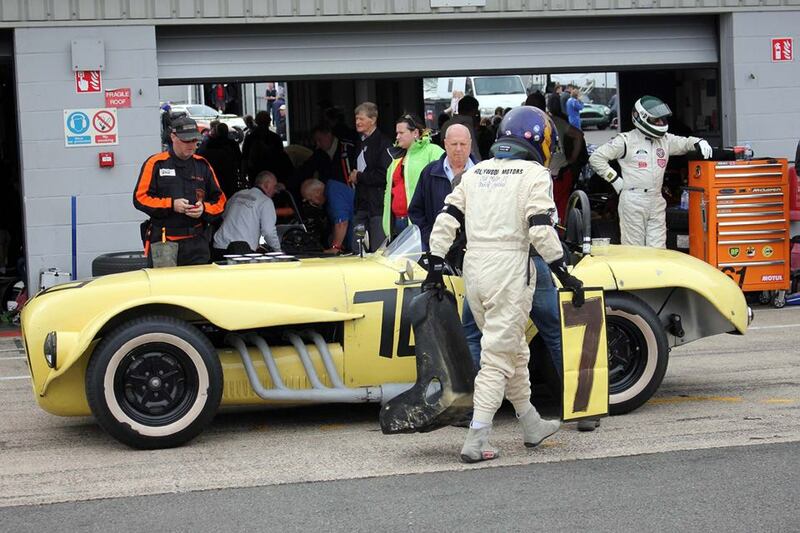 The Old Yeller II won the 2nd place in the Stirling Moss Trophy Race- Drum Brakes over 2500cc category. The Kilpatrick started well and soon “went off song” and with 2/3rd power and we came into the pit lane. We pushed the Speedster all the way to our Pit Space. Sean and Mike were not to be denied or “gutted,” as they say in UK, and they dived under the Speedster and motor to check the problem. They decided to pull off right side which was the right guess and one rocker bolt was loose and they found the nut in the ‘cover’... and the crew said to me...”Keep your ‘kit’ on and we will see...” They quickly fixed the problem and guessed on clearances and I drove back to the pit lane and entered the race again, as it was a 50 minute race. I went short while and going into the “Maggots” kinks, I went for 3rd gear and could not catch any gear at all and all gears were locked out. The clutch “was toast” and I sadly pulled off of the track away in a safe area. The most frequent comment throughout the race weekend was... “In all the many years of watching racing, this is the very first time seeing a Porsche Speedster racing. Silverstone Classic is a classic indeed and both a mind boggling racing experience and it can bring moments during the fiercesome racing to check how many “brave pills” left in the pockets. The opportunity to race at Silverstone is not without bringing humbling moments, as we felt “our clocks were cleaned” more than just once during the amazing weekend... and Silverstone is still special and “the bees knees,” as they say in U.K.